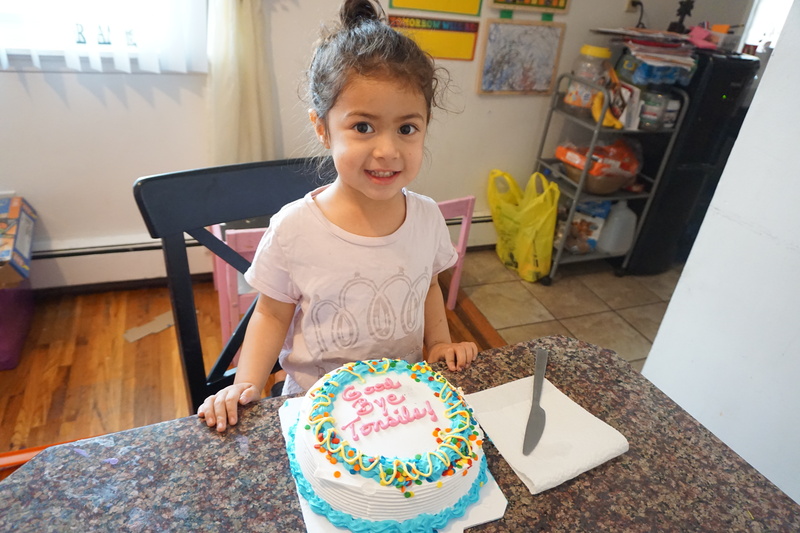 On my last Blog Post I talked about how we prepared ourselves and Annalee for her E.N.T surgery (Tonsils,Adneoids, and Ear Tubes) now I want to share a little bit on how Surgery Day unfolded itself. 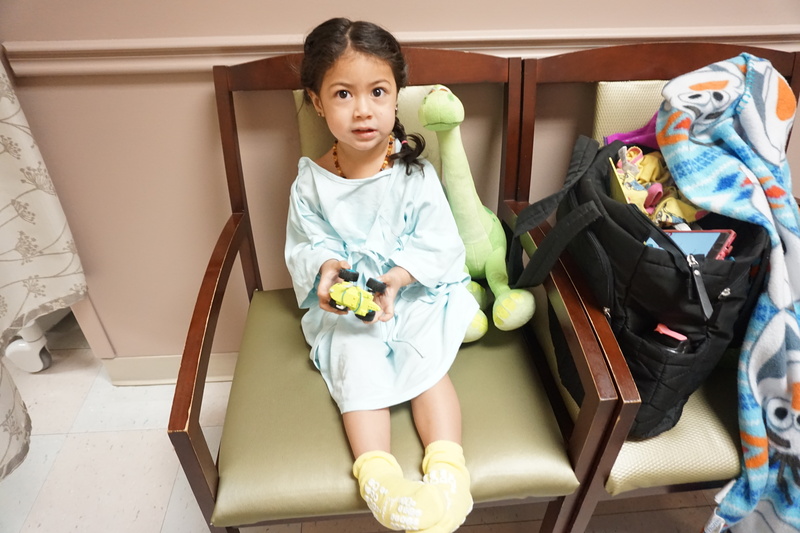 Annalee was able to bring a comfort object like a stuffed animal or a blanket, so she chose to bring Arlo the dinosaur with her. Arlo always makes her feel brave, We also brought her Ipad to watch her shows, her doctor kit, and a few other activities to distract her while we waited. The best thing we brought were her two surgery books Goodbye Tonsils and Tubes In My Ears the books made her better understand step by step everything that was happening. Even the nurses used them to explain to her what they were doing! The hospital where she had her surgery had an awesome playroom which the nurse suggested we waited in and distracted her from all the doctors and nurses coming in and out to see her. She was so excited to be there I just saw nothing wrong with her at that moment. Her faces was so lit up. Daddy and Annalee had so much fun with this wagon! He took Annalee around the hospital floor like three times. It was nice spending this time as a family right before her surgery. It didn’t only allow Annalee to be comfortable but also gave us a chance to see her smile and so happy! One parent will be allowed in the O.R only. I knew that parent would have to be me, I know your thinking WHAT!? I am the weaker parent, I have anxiety and worry pretty much about everything. I am also super emotional when it comes to them. I cry on the first day of school every year! There is something about difficult situations that makes me the stronger parent. I honestly get this strength around the kids that makes me super mom. My oldest had surgery done three years ago and Henry was in tears before even saying goodbye. Annalee was so brave! 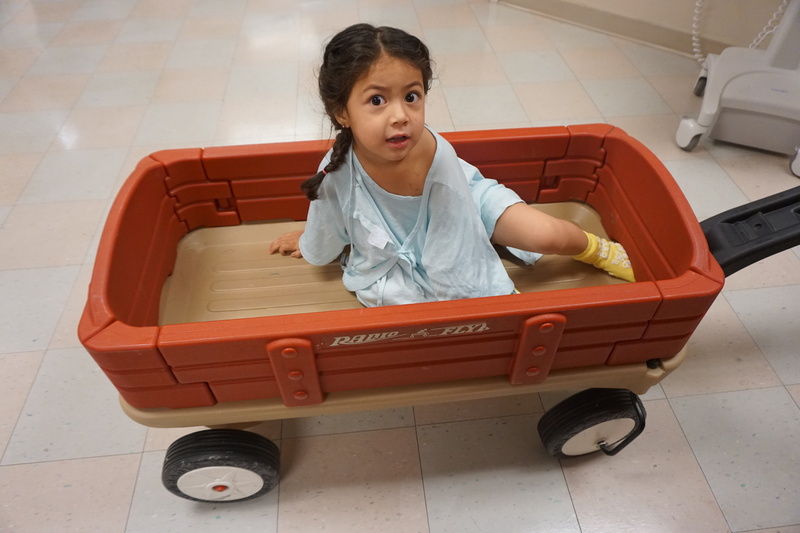 She has always had such a tough personality,let me tell you that this little girl walked into the Operating Room like a champ. She was able to bring in Arlo all the way, the doctor even had him go through surgery to show Annalee how it would be. 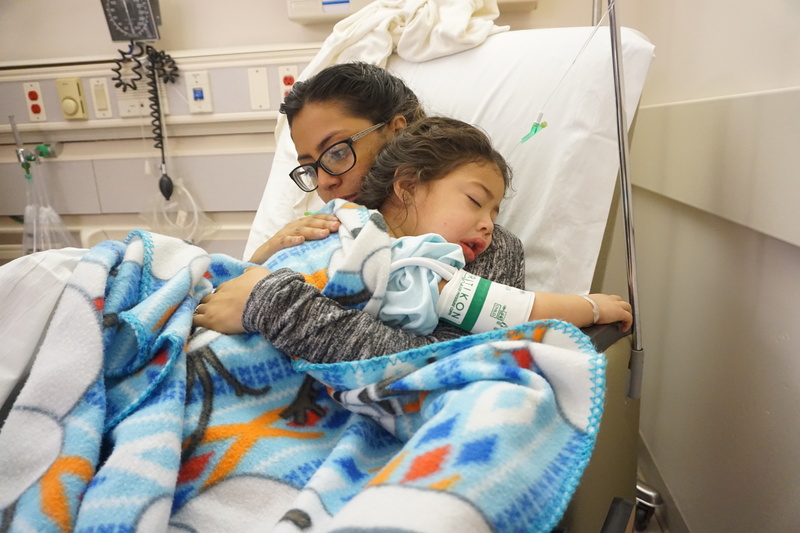 Your child will be in the recovery room for about an hour, if he or she is drinking well and showing no alert signs you should be able to take them home. After surgery Annalee was exhausted so when we got home she slept for five hours straight. 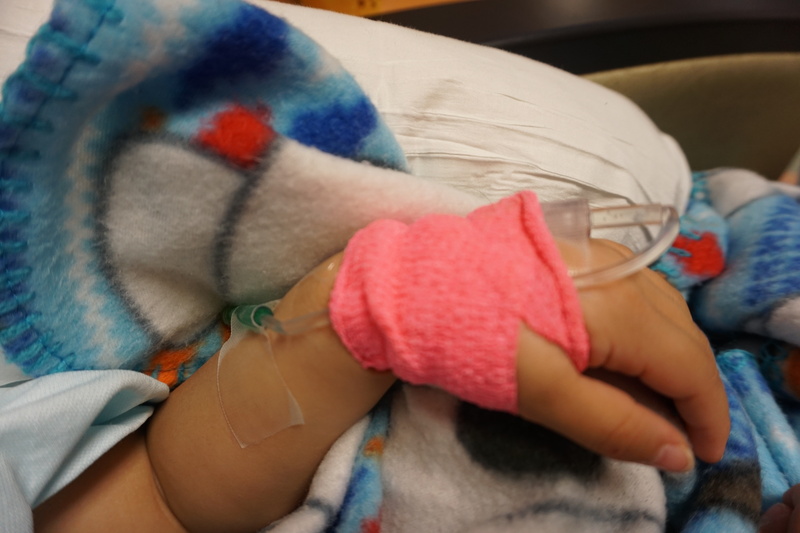 Recovery will vary from child to child and depending on the procedure. Just remember to be patient, your child will not be themselves right away. It will take some time for them to start acting normal self. 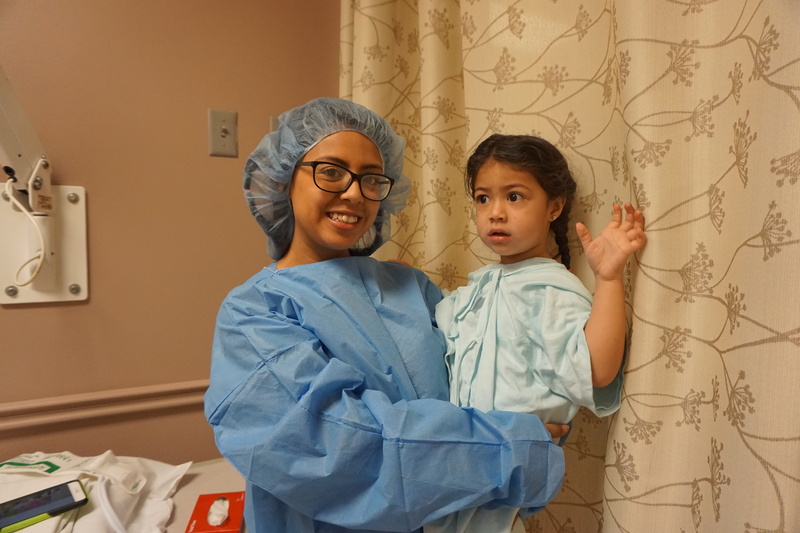 If your little one will have to get any of these surgeries and you want mom’s perceptive you can always send me a private message. One Response to "Toddler Surgery Day:Tonsils,Adneoids, & Eartubes"
She’s recovered though, isn’t she?